Cho Yong Pil under fire for 'bowing too low' in front of Kim Jong Un? Is Cho Yong Pil under fire for 'bowing too low' in front of Kim Jong Un? Legendary South Korean singer Cho Yong Pil attended the historic summit on April 27 to sing his hit song "Cafe Of The Winter". But what became controversial among K-netizens was not his singing, but his attitude in front of a Kim Jong Un, the leader of North Korea. In the picture, Cho Yong Pil is seen bowing to Kim Jong Un to greet him, with his head almost down to waist-level. 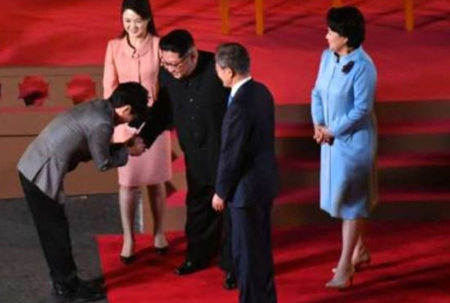 According to some K-netizens, this type of gesture was "too much" for someone who is younger than him, that he should not have lowered himself that much in front of Kim Jong Un. However, other K-netizens and media outlets defended Cho Yong Pil by stating that his gesture was a diplomatic way to show the proper amount of respect to a political guest. Despite the fact that he is younger than Cho, Kim Jong Un was still a guest in South Korea, and certain K-netizens state that it could even be considered virtuous how a legendary singer like Cho Yong Pil has the humility to do so. Furthermore, Cho Yong Pil officially claimed later that that is how he usually bows to people in general. His representatives said, "That is how Cho Yong Pil greets his fans, too, just like any other person. He didn't think this would become such a huge controversy." It was also revealed that not only did Cho bow low to Kim Jong Un, but he also made the same gesture toward President Moon Jae In's wife Kim Jong Sook. Some Korean comments under related articles include, "Why are they making a big fuss out of such things? I can't believe age has to do with any of this." "You guys blaming Cho Yong Pil are the shameful ones..." "Cho Yong Pil is the real adult!"